*Update: Added more translations for the other parts. An interview of Kim Hyun Joong titled "Do You Know Me?" Reporter (R): You seem to have been showing a more masculine side of you like today for sometime now. KHJ: I wanted to be more "manly" before and thought that I was manly at that time. But, come to think of it, it was more like a child trying to emulate manliness. Now I don't necessarily do that anymore. Time passes and you naturally become a man. That's what crosses my mind nowadays. R: You turn 29 in the year 2014. Is it already the time to talk about passing of time? KHJ: My friends all had that manly look at age 24. I am rather a little late since I have a baby face (laugh). R: I see that the role you took for this upcoming drama has that masculine character. KHJ: I don't particularly try to perform my role in a manly way anymore. My tone of voice is lower which makes my lines show masculinity. I don't force acting but perform the role as is which ends up broadening my range of emotions. As I age there are more parts that I can express. Overall, all is good in many ways now. What's inside of me became more diverse, and it's nice to take it out one at a time. R: Then what do you take out most often this time? KHJ: This project/drama will become something that will unravel things I've felt and experienced. Memories about the fights, misunderstandings, conflicts with friends will be unraveled here. If I "pretend" it will become more awkward. R: How is it working with the actresses? KHJ: I don't know about Jin Sae-Yeon for I haven't done anything with her yet. I like Soo-hyang because she's easygoing. She is not that feminine and straightforward. R: Your fans in China would be happy when you get there. R: Does the romanticist character suit you? KHJ: Romanticist....I don't know it very well. Sounds like protecting someone by being loyal? It's not as if the present era is the Jeosun Dynasty. To be honest, I don't think one can find that many "romanticists" in our generation. People tend to date often casually. Of course, I know the feel of a "romanticist," but I don't think it'll be easy to portray what the authors will write. R: What are you going to do then? This project is presented as an "emotional, romantic noir." KHJ: It is packaged that way. haha I think it is more of a period drama. It's rather closer to the drama "The Wild generation" that was very popular some time ago. When this is compared often to "The Wild Generation," it makes me feel good to be compared to such a wonderful drama. R: Is there any pressure about this being a big project? KHJ: No. I don't care more just because the production costs 15 billion Won or care less because it costs 3 billion Won. Really..I don't. I don't know since when but it's become "It is what it is." R: Then, is filming site comfortable? KHJ: It is always uncomfortable, not to mention many restrictions, but it's fun. I think it's because of the good actors...what you might call an "ensemble." The things I haven't felt before such as working together and asking each other "did you eat yet?" make me feel like a part of the team. That's what I like. Once you are stuck together somewhere in the country, you have no choice but to get to know each other. R: So, could we expect to see some romantic scenes in this drama? To tell you the truth, there were many scenes that were too over-the-top lovey-dovey in the past dramas. For example, you whispered a line "I can go anywhere with a white cloth and the wind" in Boys Over Flowers. KHJ: The lines are more realistic now so it's easier to act. To be honest, I've only been fighting mostly, so there was no time to do romantic scenes. R: Then, are you fighting well? KHJ: Yes. I'm having fun(?). I find that getting beat up makes feel better than hitting someone. R: It sounds like your upcoming China shooting will be fun. KHJ: It was originally scheduled for a month but looks like we'll be staying for only 2 weeks, which makes it more difficult. But, I'm looking forward to it a lot. The Hong Kong actor, Jackie Chan, is filming there currently at our Chinese filming set. I heard he bought the set to shoot a film. It's going to be fun to shoot the drama as well as see Jackie Chan. R: You have many fans already and that would generate even more fans. How does it feel to know that there are many people all over the world who watches your every move? You even made the cover of a South American magazine. KHJ: Feels good. I had concerts in Japan this past October, and there were many fans greeting me, making me happy. But honestly, the overseas fans don't really know me well. They like Ji-hoo from Boys over Flowers, not me (My 2 cents...dear KHJ, you are so wrong about that...lol). I saw that those fans couldn't get used to what I did there. When I danced in the countries I visited for the first time, they would say "Ji-hoo is dancing well." They know I'm a singer but because it's their first time seeing me that way, they are taken aback. Not to mention, I'm physically more fit than when I was in Boys Over Flowers. R: You know that's how it starts. First, people fall for the looks, then searches for the projects you were previously involved in. KHJ: I get that. First of all, you have the language barrier (laugh). Wouldn't it be similar to my liking Miranda Kerr but almost knowing nothing about her personality? It begins that way, and you start getting to know his/her inside which leads to attraction. R: That's right. Somehow, first impressions do affect how good a feeling you have on someone. KHJ: I consider the first impression very important. Most of the time, if I get "a bad vibe" from the beginning, I end up not hitting it off with the person in the end. R: That's what people call "good at reading people." I guess you are like that. KHJ: Not really. I don't tend to trust people easily but can get a good vibe from good people. For example, Dalhwan-hyung is someone I'm filming with these days, and I had a good vibe about him only after exchanging a few words. I don't drink with people who don't see eye to eye with me, and Dalhwan-hyung and I hit it off when we drank together. I found out that he also likes traveling alone, and we have a same set of values in various ways. R: Haha. You are a well-know drinker in the showbiz, but looks like it's difficult to have a drink with you since the first impression screens who can drink with you. KHJ: I dislike drinking in uncomfortable situations the most. That's because I enjoy drinking and don't want to ruin those good times by being uncomfortable. KHJ: 4 bottles of soju. I used to like only soju but learned to like the taste of hard liquor and wine a bit. I honestly didn't know the taste of alcohol before. But now I feel like I'm beginning to know the taste. R: I started with the looks and got side tracked to drinking. So, I didn't get to ask you what I really wanted to. Are people as good looking as you happy with their looks? R: I'm content. Of course, there are so many good looking people out there. Leonardo DiCaprio comes to mind right now. I like myself just the way I am. R: However, you are not just some good looking star...a bit on the 4D side..
KHJ: I guess I just live my life carefree...haha I don't concern myself with the way how others might look at me and do what I want to do. That's how I can live freely without restrictions. R: I hear when you work you should put most emphasis on what you want to do. What is it that you really want to do? KHJ: Of course acting and singing. Also, I want to ride my bicycle and travel the whole country, enter a triathlon, and get a certificate for sailing. When I get older, I want to open a scuba shop in Jeju-do, not for money but as a hobby. R: You can't always do what you want. What do you do to get rid of the stress when that happens? KHJ: Do whatever you want to do except the things you can't do. R: Does that include dating among the things you want to do? KHJ: Dating...not so much. These days I don't have anyone I like that much. I like someone who can talk well but not always serious at the same time. You know one of those people who is a pleasure to be around. I like people like Tak Jae-hoon. R: You're known for "giving it all" when you date. If you do date again, are you ready to do that? 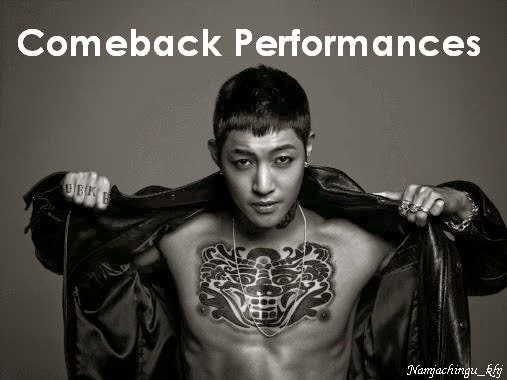 KHJ: Yes. I should "give it all." If I love the person, how could I not? R: But then, it would hurt that much more when you break up. KHJ: You deal with it then. If you think about this and that, it will only get you a headache. I am more like "let's do what's due today and do what's due tomorrow." It's a bit weird to say this but I might not even be here tomorrow due to an unfortunate event. Therefore, enjoy as much as you can today. R: You sound like your motto is still "You only live once." KHJ: Yes. Only live once. I don't want to live my life worrying. I want to enjoy my life doing what's appropriate for a 20 year old when I'm 20 years old and doing what's appropriate for a 30 year old when I'm 30 years old. Let's say you work day and night until you turn 40 and 50 to save money. And then saying at age 50 "Now that I've saved enough, I should play soccer" won't make it actually happen. R: The questions have been short answer questions, but they are funny and funny some more. However, there is philosophy in them. KHJ: I guess it's because I'm quick tempered. It's what I decided to do so what's the point in sulking? We will only get on each other's nerves. Since we are doing it we might as well do it cheerfully and quickly. R: It's difficult to do that with dramas. KHJ: You gotta wait. That's not something you can do on your own. Everything else that is under my power, I do it quickly and in a fun way. R: Sounds like it's a fun way to live. KHJ: There will be more fun things after the interview. KHJ: It will be fun in between. All right..a deal! Shall we do just three more questions as last questions? R: Then I want to make a deal as well. You ask and answer your own questions. KHJ: What I want to say is about my plans hereafter. When I'm done with The Age of Emotions, I plan on doing a drama and a movie in a row. Then I'll be gone (everyone burst into laughter). This is about all I will say.... move on.